Stimulation of the postural responses brings about diverse stimuli on joints, joint capsules, tendons, the vestibular system, stretch receptors of the musculature etc. Additionally, there are exteroceptive (contact) and interoceptive (visceral movement, pleura and mediastinum) stimuli that arouse the CNS as part of the stimulation of the postural responses. The rapid change in position when performing the postural responses also leads to characteristic afferences via the visual receptors. When the postural responses are precisely executed, a constant afferent inflow from various sources of stimuli is to be expected. Consequently, there results a characteristic, reproducible CNS response to a complex, in its totality however “standard”, stimulus. Each postural response represents in this sense a characteristic afference unit that grants access to a pattern of posture and movement, which if necessary—in the sense of conflict with the individual’s environment—is provided by the CNS. These afference units differ depending on the postural response (e.g. the head control and the Landau reaction). However, similar segmental patterns are observed within the reaction-specific global reaction (e.g. posture of the legs in the head control and the Landau reaction). These characteristic similar segmental patterns across reactions are the consequence of a central nervous coordination process that stands in strict correlation to the developmental age of the child. In new-born periods there is in Collis, in the Peiper-Isbert and the Vojta reaction a horizontal arm movement known as the Moro reaction. 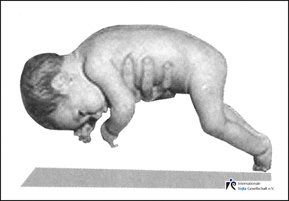 After this “holokinetic” developmental phase, the behaviour of the arms in the Peiper-Isbert reaction between the 6th and 12th weeks resembles the tonic components of the Moro reaction, as observed in the second half of the 1st trimester. In the Vojta reaction, this type of reaction first appears after the 10th week and persists until the 20th week. In the horizontal Collis reaction, it only appears from the 7th until the 8th week of development. 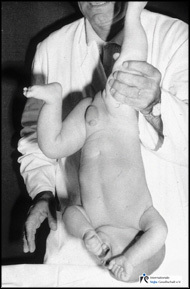 The posture of the legs is the same in the first phase in the Landau reaction, the axillary suspension reaction and also approximately so in the head control. 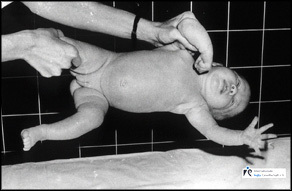 The inert flexion posture of the legs persists in the axillary suspension reaction and in the Landau reaction throughout the whole of the first trimester; it ceases however in the head control by the middle of the 1st trimester. There is an active flexion of the legs towards the body. We call this pattern of movement and posture a flexion synergy of the legs. It appears in the head control in the middle of the 1st trimester, in the axillary suspension test and in the Landau at the changeover from the 1st to the 2nd trimester, in the Vojta reaction first at the changeover from the 4th to the 5th month. Flexion synergy of the legs also subsides in all of the above reactions, but at different times. the motor responses to the change in body position must be visible and follow a set pattern, i.e. they must be reproducible. the motor responses must reflect the reactability of the central nervous system in different phases of development. normal reactions must be differentiated from abnormal reactions. The automatic regulation of body position is an active sequence. It reveals a very complicated function of the CNS that is already present during new-born periods. The postural responses, as incidences of reflex locomotion or of reflex postures, have a visible kinesiological content. They draw on a visible flexing of the muscles. By means of the normal postural responses other CNS functions can be inferred. The child can grasp radially. Prerequisites for this are the pronation movement of the forearm, the complete opening of the hand and the abduction of the metacarpus. The Collis horizontal reaction shows us all of these. 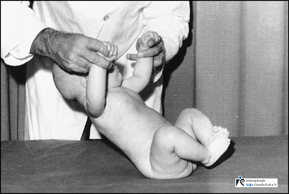 The child can put weight on the palms of the hands in a prone lying position. It has achieved symmetrical as well as single elbow support. Therefore in a prone lying position one hand is free for grasping. In the future, the child will have—assuming further development without disturbances—no essential disturbance in stereognosis. The grasp reflex of the hand has ceased. That is the prerequisite for the normal support function of the hand. 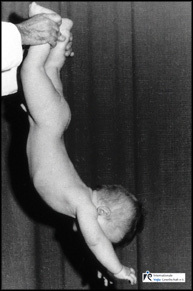 The child can turn over, in a coordinated way, from a supine lying position to a prone lying position. For this, it must be possible for the corresponding support function in the pectoral and pelvic girdle as well as the support function of the body in a side lying position to be segmentally triggered. A child that turns over en bloc cannot support itself on its side. We recognise this function on completion of the 2nd phase of the Vojta reaction. The optico-facial reflex (reflex blinking due to an optical stimulus) can be demonstrated. Otherwise, a visual disturbance must be ruled out and/or mental developmental problems must be considered. The 3rd phase of the Peiper-Isbert reaction determines not only the level of maturity reached on completion of the 2nd trimester, but also presupposes the presence of an optical contribution in the regulation of postural reactability. If the developmental level that the child has reached coincides with its calendar age, then a fundamental disturbance in mental development can be ruled out. 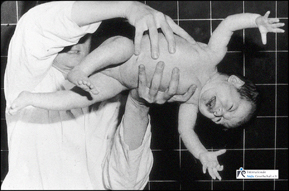 Infantile cerebral palsy is not present if the above postural responses proceed normally. For every development of cerebral palsy, even if minimal, is already characterised in the first weeks of life by disturbance in postural reactability, which shows itself in abnormal or disharmonious postural responses. Disharmonious means that segmental patterns of different developmental states are observed simultaneously (e.g. a lower level of uprighting against gravity in the arms than in the legs). If the postural developmental level reached coincides with the calendar age, then a serious congenital hormonal or metabolic disturbance with pathological consequences for mental and/or motor development can also be ruled out. The postural developmental age should be determined before taking note of the calendar age! If the level of postural reactability, the developmental level of uprighting against gravity, phasic (spontaneous) mobility and the calendar age coincide with each other, then the child is normally developed with a normal development prognosis.